Identifier is exactly "2016-0152-F Segment 1"
This collection consists of the Chron Files of Robert Bell, Special Assistant to the President for National Security Affairs and Senior Director for Defense Policy and Arms Control, National Security Council (NSC). The files contain records related to a number of military and weapons proliferation issues including policy discussions on the drafting of Presidential Decision Directives (PDD) as well as records related to treaties on landmines, Nonproliferation (NPT), and the Conventional Test Ban Treaty (CTBT). The collection also includes interagency working group documents on chemical weapons issues and the chemical weapons convention (CWC). 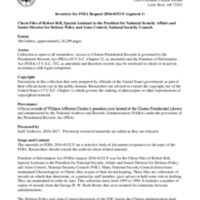 The files also contain records that relate to the operations of the military and military policy, the Defense Base Closure and Realignment Commission (BRAC), and the National Security Telecommunications Advisory Committee (NSTC).